There’s been a vegan/raw chocolate mousse recipe making the rounds that derives its creaminess not from dairy or whipped egg whites but from avocados. Right. I’ve never made nor tasted it but have always looked upon it with a half-cocked eye, dubious of the flavor. I am steeped in tradition and a proper mousse contains melted chocolate enriched with yolks, whipped egg whites and full fat cream. One of my favorite Parisian meals was capped by a towering bowl of chocolate mousse, doled out by an aproned waiter in enormous spoonfuls. I can guarantee there was no avocado in that mousse. But I’ve come around on my thinking having since made an avocado based popsicle. They’re rather delicious and quite surprising. 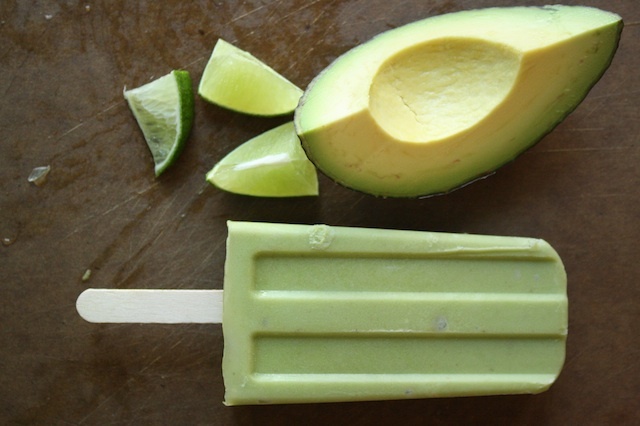 I was playing around with a new book and came across a recipe for Avocado-Lime Paletas. Very interesting. We were heading up to a friends cabin and I thought I’d throw my molds into the bag with the waffle iron, ice cream maker and other ridiculous things I lug up there. I typically bring random items and food experiments along with me, so what was one more? I mixed up a few batches ahead – a half batch of the avocado and a full of sour cherry to freeze upon arrival. One sunny afternoon, I broke them out asking “Sour Cherry or Avocado?” I was stunned the avocado went first. I’d added a good hit of lime juice, a bit of salt and a shot of tequila, just for fun. They were smooth, creamy and incredibly delicious, to all of our surprise. If you know anyone with dairy issues, give it a try. And be ready for the color – it’s a quite shocking shade of khaki green. With Cinco de Mayo just around the corner, I’ve got a few batches in the freezer ready to go and plan on bringing them back to the cabin this summer due to popular demand. But I’ll make a bigger batch this time. I also found these fun things, which will be easier to deal with up at the cabin. I’m pretty sure none of us have ever had Avocado Otter Pops before. I’m a skeptic no more. Maybe one of these days I’ll try that mousse. STRESS THERAPY BAKING FACTOR: OLE! These are fun and perfect for any summertime parties. They’re completely unexpected in color, flavor, texture and ingredient and will catch everyone by complete surprise. Plus they’re dairy free so those with issues can enjoy without concern. Without the cream I’d usually use, I imagine they’re lower in calories but are by no means low fat. Regardless, I’m going to call these “healthy” in my head. Combine the sugar and water in a small saucepan and boil until the sugar is fully dissolved. Add the lime zest and let cool to room temperature. Strain into a bowl (to remove the zest) and for best results, chill for several hours. Cut the avocados in half and remove the flesh. Add to a blender with the lime juice, tequila and salt and process until smooth. If you need a little more liquid to get things moving, add some of the lime simple syrup. Add the avocado mixture to the simple syrup and stir until well blended. 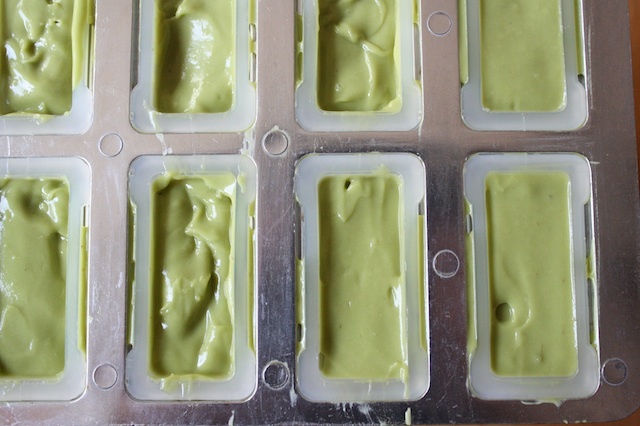 Pour into popsicle molds and freeze until solid, at least 4 hours. To remove from the molds, run warm water along the outside and carefully ease out of the cavities. For longer storage, remove from the molds, wrap individually in plastic wrap, place in a large Ziploc bag and store in the freezer. I simply love the photos for this recipe! It makes me ready for a slice of summer time! Left the booze out for the kids 🙂 but will absolutely be trying the alcoholic version soon as this combo is amazing. Your images are fantastic and appetizing! 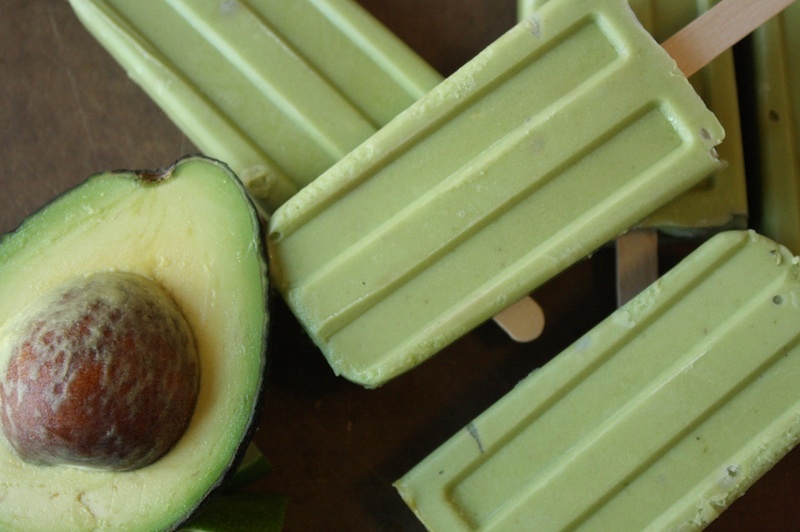 I love avocado lome Popsicles! !